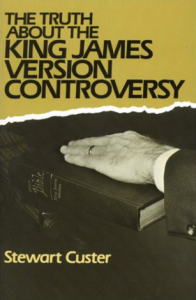 This 35-page booklet was written in 1981 by a long-time professor at Bob Jones University. BJU has long stood for the historical and biblical view of Bible translation. Custer fills this little volume with nuggets such as: Plato’s dialogues are preserved to us in only one manuscript, in contrast to the New Testament which is attested by over 5000. The Textus Receptus itself underwent 18 editions, and the one people use today is basically from John Mill in 1707, not the original one from 1633. Of the 500 pages in the Greek NT, only a total of about half a page is in any question. Custer also has a chapter on the unusual errors of Peter S. Ruckman.